Growers across the southern region are encouraged to make every effort to take accurate soil tests to guide nutrient input levels this year following the dry conditions of 2015. Well-below-average growing-season rainfall saw substantial areas of crops across the region – particularly in Victoria’s Wimmera and Mallee areas – cut for hay as a salvage operation instead of being taken through to grain. International Plant Nutrition Institute (IPNI) regional director Dr Rob Norton says it is important that growers soil test for nitrogen (N) and phosphorus (P) in most situations and for potassium (K) where low levels are indicated. Removal of these nutrients will be different compared to other years. 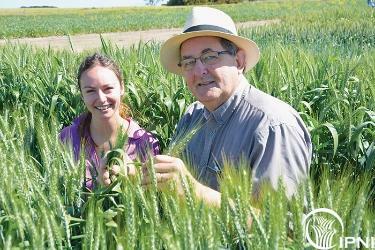 In a 2.5-tonne-per-hectare wheat hay crop that would have yielded 1t/ha grain or a 2.5t/ha canola hay crop that would have yielded 0.6t/ha grain, Dr Norton says there could be two to three times more nitrogen removed and up to 10 times more K removed (Table 1). Should a soil test show K levels lower than critical, Dr Norton says growers should implement a plan to replenish K. Soil K may also be adequately supplied deeper in the soil so the topsoil values alone are not always a clear indicator of the likelihood of a crop response to added K. A deeper (>10 cm) soil test can be useful but there are no cailbrated and validated values to guide K applications in the eastern states. The most efficient way to do that is to drill muriate of potash (MOP) at seeding or close to seeding rather than top-dressing it. Dr Norton says soil tests will be critical not just to monitor K levels but also for P and N following widespread heavy rain in early November. “A replacement strategy for P is appropriate for most growers, so that rates for 2016 can be reduced, but in most cases some P at seeding is beneficial to early crop growth. “In terms of N, summer rainfall will stimulate N mineralisation, which will mean that starting levels of N at sowing could be anything,” he says.